The Piedmont Tsunamis closed out their regular season on-the-road Saturday, defeating the Ridgewood Barracudas by a score of 2824 v. 2460. 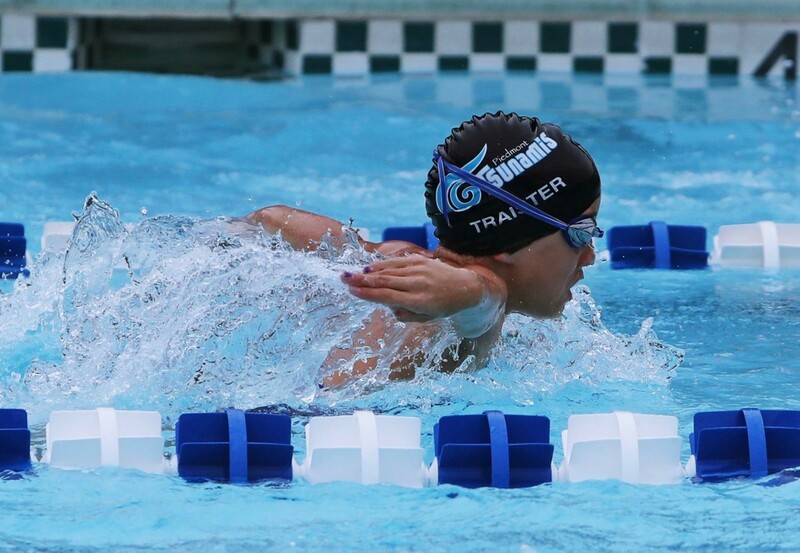 The contest capped a full summer of excitement for the Tsunami youth, as the victory marked an unprecedented accomplishment for the club: their first undefeated regular season as a PWSL Blue Division member. The day was not without its external challenges for both teams. 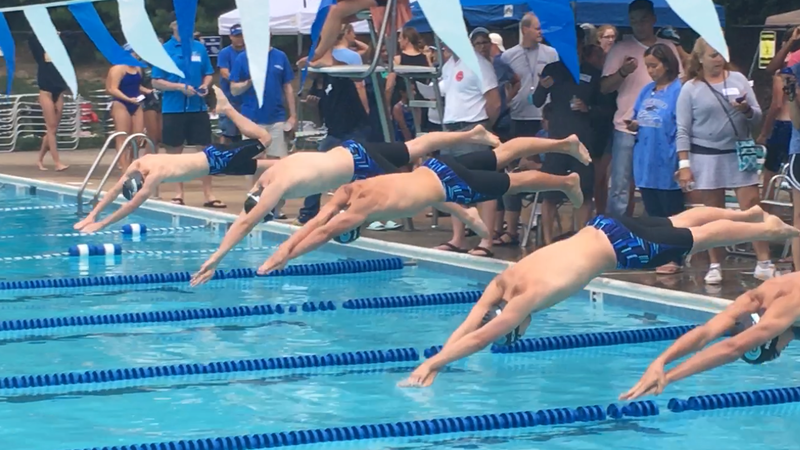 Daunting storms threatened the morning swims at several stages in the meet – with significant downpours blasting the competitors as they pushed through final butterfly and relay events. Lower than normal temperatures also seemed to have an impact on each of the clubs, with both the Tsunamis and Barracudas marking only 27% faster times versus previous week’s accomplishments. Weather and road-travel aside, the Tsunami squad would have to rely on stout individual performances once again throughout the day, having narrowly escaped the morning relays with only a slight lead. 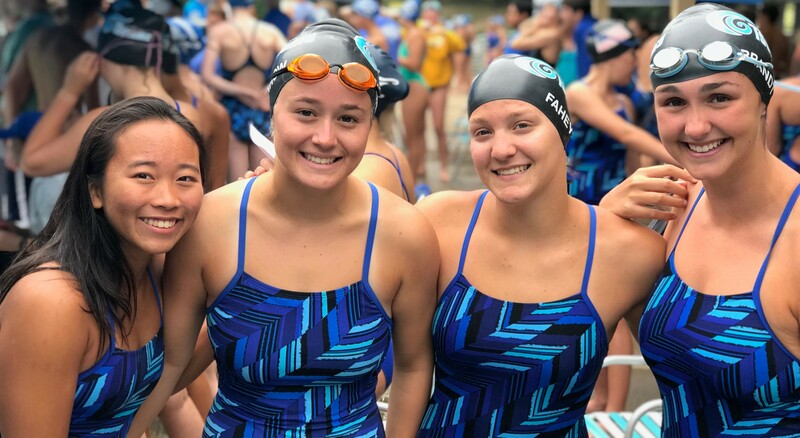 And while personal bests were at a premium, the Piedmont swimmers were still able to come close enough to prior marks to maintain the meet lead throughout, while notching several top times for the league as a whole. The most notable of these were found with Boy’s 8&U rising star Christian Mulroe – who took leading PWSL scores in each of the three individual events he competed in on the morning (back, breast & fly). Piedmont 15-18 Girls (from left) Jenny Lee, Livi Morrow, Natalie Fahey, and Lindsay Brandt prepare to attack the 50 Meter Fly on Saturday. First place honors for Piedmont were had in 60% of all head-to-head events, and were taken by (PWSL top overall times also noted by number in parenthesis): Christopher DeVito (1), Maddie Richardson, Charlotte Hannam, Camille Spink (1), Henry Radzikowski, Anna Dzouenko, Alex Huang, Eric Liao, Katherine Diatchenko, Christian Mulroe (3), Joseph Coleman, Alex Diatchenko, Theo Drescher, Sebbie Borden, Emma Hannam (1), Amber Parsons, Alyssa Sagle, Ryan Strotheide, and Luke DeVore. The only record for the morning was once again felled by Christopher DeVito for the 9-10 Boys. This week, DeVito shaved a hair off his 50 Breast mark set only seven days ago in a home meet against the BWaves. Ultimately, DeVito was able to better the time by another .01 seconds, setting the new bar at 43.06. A full heat of Tsunami 15-18 Boys launch into the 50 Meter Freestyle. Bragging rights for the top of PWSL will dramatically culminate at the Piedmont home pool next Saturday, where the undefeated Tsunami team will clash once again with divisional rivals Braemar and Sudley, in what will statistically be one of the most closely matched final competitions in Blue Division history.